Resize photos with the possibility of applying different effects to them. 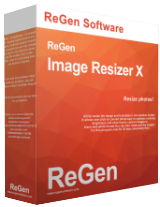 ReGen - Image Resizer X 1.5.0 was available as a giveaway on April 3, 2016! ReGen - Image Resizer X is a tool for resizing digital photos with the possibility of applying different effects to them. The program allows you to change the size of a single file or a group of files. The processing results can be saved in a separate folder in one of the supported formats (JPG, GIF, BMP, PNG, TIFF, ICO). When you select JPG, you can adjust its quality. Selecting TIFF, you can set the compression algorithm. Resizing photos you can specify the parameters of their height and width. The program also lets you add watermarks and filters. How would you improve ReGen - Image Resizer X 1.5.0? ReGen - LockPC will protect your computer. The utility enables you to lock your computer at any time you want. It can also shut down, restart, turn into sleep mode after a specified period of time. ReGen - LockPC has a large number of settings that will help to set up a program up to your needs. You can also set hotkeys to lock your computer. The program can be opened from the system tray during the operation, and does not consume much space on the desktop and in the memory. Russian T&Cs, help menu in Russian ok if you speak Russian as for the program itself couldn't find anything that would make me want hand over my hard earned cash for especially as it crashed a couple of times during testing and the GUI is clear but very basic. Better freeware that can much more available. There are a great many people nowadays using computers who do not have an inkling as to the power of PC's and are not aware of the many capabilities of Windows which are 'Built In'. This is what 3rd party software is all about - shortcuts to make things easy. As others have pointed out, there are plenty of other software's which can do the same as this one. I would recommend trying out a variety of different programs to see which one 'works for you', my choice won't necessarily match yours. Try this one out - it might suit you - it's free! There are a great many people nowadays using computers who do not have an inkling as to the power of PC's and are not aware of the many capabilities of Windows which are 'Built In'. This is what 3rd party software is all about - shortcuts to make things easy. As others have pointed out, there are plenty of other software's which can do the same as this one. I would recommend trying out a variety of different programs to see which one 'works for you', my choice won't necessarily match yours. Try this one out - it might suit you - it's free! Google translate does a good job, good enough to be ale to understand. Russia has produced some first-rate programmers often with excellent experience in assembly language resulting in very fast programs. Unfortunately, today's developer isn't one of them. Keld Mortensen, Google translate does a good job, good enough to be ale to understand. Russia has produced some first-rate programmers often with excellent experience in assembly language resulting in very fast programs. Unfortunately, today's developer isn't one of them. I thought I might install from their website and use the registration key provided - but my virus detection program threw that download out. I installed the GOTD version without a problem - except that the T+Cs are in Russian as is the help menu. Fed the registration code in manually as previous respondents have advised. It's a very basic program and I suspect I'll just keep using the Image Resizer I've integrated into File Explorer as being much quicker. I thought I might install from their website and use the registration key provided - but my virus detection program threw that download out. I installed the GOTD version without a problem - except that the T+Cs are in Russian as is the help menu. Fed the registration code in manually as previous respondents have advised. BUT... It's a very basic program and I suspect I'll just keep using the Image Resizer I've integrated into File Explorer as being much quicker. David, How did you integrate an image resizer into File Explorer? Right click and "Resize Pictures"
Tony, it's the one Nigel mentions below: http://imageresizer.codeplex.com/ It's identical to Microsoft's offering for XP > W7. Works on W8 < W10 Right click and "Resize Pictures"
The built-in Windows-7 resizer is the best I have seen (in terms of minimizing losses during resizing). You get three choices for size change AND you can use in batch mode. David, The built-in Windows-7 resizer is the best I have seen (in terms of minimizing losses during resizing). You get three choices for size change AND you can use in batch mode. David, Thank you very much - I downloaded it and it works just fine for my purposes. ania20011, FYI the capital letter 'O' is more rounded than the zero '0' which makes the two distinguishable. Julian Clayton, thanks for that. However, depends on what type of screen setup you're working on and person's eye sight. I try to avoid 0O when used for passwords that can not be copied and pasted into place. shaun, Very true on the 0 and O. Makes me mad at times when you buy a product and have to register it by filling in the serial number - Is that a zero or a one! Are you kidding with this software? john, Absolutely, been using it for years. So what are these filters they are talking about? At first glance I was hoping maybe this software could enlarge images without pixelating them, like PhotoZoom does by the help of its s-spline technology. But it seems to me this software here does nothing but the standard resizing procedure which every other image viewer or editor can do. A real one trick pony? So what are these filters they are talking about? At first glance I was hoping maybe this software could enlarge images without pixelating them, like PhotoZoom does by the help of its <i>s-spline</i> technology. But it seems to me this software here does nothing but the standard resizing procedure which every other image viewer or editor can do. A real one trick pony? john, I know. But IrfanView's B-spline algorithm always results in quite a lot of blur, while the Lanczos algorithm isn't as blurry but still leaves some pixelation. Mad Ollie, True..... My thoughts exactly when I saw "resize" - thought it was resize up. Not sure why I would want this program - most all image editors will do the resize! Just thought you might like to know I was able to register simply by copying the complete registration code and pasting it in the first box. The code entered correctly, automatically inserting itself over all five boxes without the need to laboriously type it in! Why use a paid for program when there is "Image Resizer for Windows" that works great and integrates into windows "Right click menu". Although not updated in a while, it works perfectly well on Windows 10 and can be had from. To compete at $20 for such a simple program it has to have something special, it doesn't. Tested it on a folder in which one of the JPG files causes some image programs problems, in this case it crashed the program. It is a confusing program to use, even the simple registration process makes no sense, before it is registered in one of the menu items it says "Buy" and this opens up the registration window. In one of the panels entitled information the information presented bore no relationship to the image selected, totally confused as to what this information was supposed to be about. Even more confusion is presented when attempting to decide the output size, and it did not even appear to be customisable. Insufficient control of the output compression, same with the filters. If I was being polite I would say this program is in early beta, but frankly it's not that good. There's a lot of freeware that does resizing of images- http://download.cnet.com/s/free-picture-resizer/windows/?editor-rating=4 To compete at $20 for such a simple program it has to have something special, it doesn't. Tested it on a folder in which one of the JPG files causes some image programs problems, in this case it crashed the program. It is a confusing program to use, even the simple registration process makes no sense, before it is registered in one of the menu items it says <b>"Buy" </b> and this opens up the <i>registration</i> window. In one of the panels entitled information the information presented bore no relationship to the image selected, totally confused as to what this information was supposed to be about. Even more confusion is presented when attempting to decide the output size, and it did not even appear to be customisable. Insufficient control of the output compression, same with the filters. If I was being polite I would say this program is in early beta, but frankly it's not that good. I sometimes wonder if commercial software developers exist in a parallel, yet different, universe to everyone else. As is the case today. As with any software faithfully and consistently refined over almost two decades, IrfanView nowadays has so much under the hood that I'd be surprised if all its capabilities were known to all its users. But at least most folks are aware that, with the program open, it's simplicity itself to hit hot key B (for 'batch'), go straight to 'Advanced' (options) and then bulk re-size, bulk-re-encode however many image files may be desired. It's not that I'd wish to discourage today's developer in any way, but really: a $19.95 re-install price for today's giveaway in the face of an existing piece of ultra high quality freeware which many (including myself) find as indispensable on a day by day basis as anything from Adobe? Thanks but no thanks. I sometimes wonder if commercial software developers exist in a parallel, yet different, universe to everyone else. As is the case today. To my certain knowledge, a program called IrfanView was created by the then university student Irfan Skiljan nigh on 20 years ago, since which time it has been downloaded and installed by millions of computer users worldwide (a) because it's good and (b) because it's free: http://www.irfanview.com/ As with any software faithfully and consistently refined over almost two decades, IrfanView nowadays has so much under the hood that I'd be surprised if all its capabilities were known to all its users. But at least most folks are aware that, with the program open, it's simplicity itself to hit hot key B (for 'batch'), go straight to 'Advanced' (options) and then bulk re-size, bulk-re-encode however many image files may be desired. It's not that I'd wish to discourage today's developer in any way, but really: a $19.95 re-install price for today's giveaway in the face of an existing piece of ultra high quality freeware which many (including myself) find as indispensable on a day by day basis as anything from Adobe? Thanks but no thanks. Isn't this software very similar to the software included with W7? I've got something that you make these adjustments by using three separate software and using paint; the result is identical. Isn't this software very similar to the software included with W7? I've got something that you make these adjustments by using three separate software and using paint; the result is identical. Or am I wrong? Quickly downloaded and tested converting folder with 2mb photos to 640 x 480. Fast, Clean. Wish could add to right click menu. Where do I put registration key? Quickly downloaded and tested converting folder with 2mb photos to 640 x 480. Fast, Clean. Wish could add to right click menu. Where do I put registration key? Did you get an answer yet? Same issue obviously here too. GrinderGuy, Did you get an answer yet? Same issue obviously here too. OK what they failed to convey is that once the program is installed, you have to go to the help menu, then select the BUY/Registration. Now you will see 5 empty boxes where you will TYPE each set of 6 characters ONE at a time (no pasting, if you try to paste only the first box will fill). After entering all 5 sets of 6 characters, simply click the Register box. If you entered the 30 characters correctly and follow what I mentioned about ENTERING ONE BOX then the next, but if you use the Paste it will not work and if you get one character wrong it also will not work. I just spent a good 10 minutes finding out that you literally have to manually type each box in order or you wont get the license to enter correctly. My product is not fully registered. Do what you will though, try and paste or whatever, you will just be wasting you time. Dave, You can download version 1.6.1.0 from the official site. In the version of the key is copied through ctrl + V. And it is possible to register key from version 1.5. I downloaded the one from here, I didn't go to the site I downloaded like I have done for years via FB. In any event, I do have a higher version than offered here (v1.6.1.0), again didn't notice the version since this website doesn't always have the latest versions. I obviously checked the version I have and as I said it's a newer version and the Serial works on the version I have like I said it's fully registered. I couldn't copy and paste, but appreciate your feedback. Hey Maks, I downloaded the one from here, I didn't go to the site I downloaded like I have done for years via FB. In any event, I do have a higher version than offered here (v1.6.1.0), again didn't notice the version since this website doesn't always have the latest versions. I obviously checked the version I have and as I said it's a newer version and the Serial works on the version I have like I said it's fully registered. I couldn't copy and paste, but appreciate your feedback.